Combining the LiveRoof extensive green roof system with specimen trees and shrubs may present an attractive alternative to traditional intensive green roofs, reducing weight load and both installation and maintenance costs. Green roofs for amenity space are on the rise as building owners capitalize on the many benefits of providing onsite connection to nature for employees, residents and visitors. 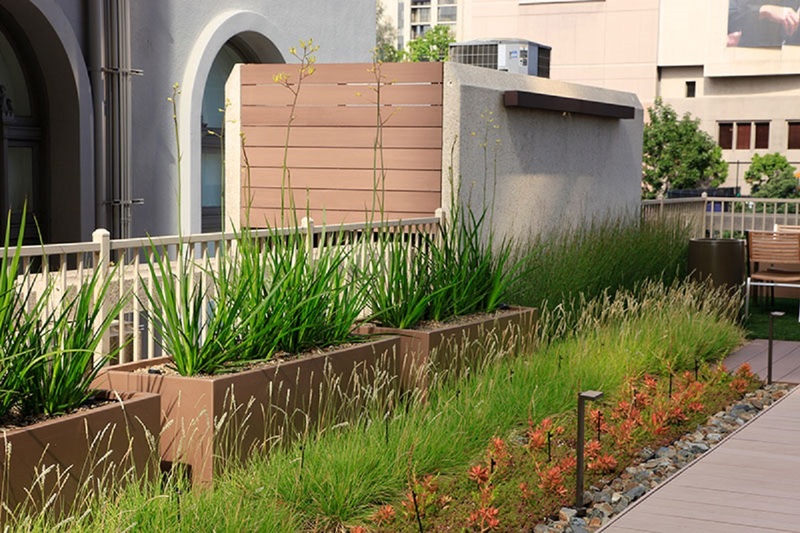 These roof garden areas may also serve to meet 100% of local stormwater and biofiltration requirements. How Does LiveRoof work in these types of applications? LiveRoof modules arrive to the job site fully grown, with soil depths ranging from 2.5 to 8 inches, depending on module size.Designers and contractors have creatively used LiveRoof for instant intensive-extensive green roofs. Contractors may place LiveRoof modules inside of precast concrete, fiberglass or sheet metal planters to provide the visual effect of a much deeper green roof, but without adding excessive weight load to the roof. For these applications, the LiveRoof modules are placed atop layers of lightweight material such as EPS foam. These raised planter areas not only provide greening, but may serve as ledges or benches for seating and simultaneously deter people from trampling the plants. Specimen trees or shrubs can be incorporated to provide vertical interest and create the look and feel of a long-established garden planting. These steel, fiberglass or concrete planters can help to contain the woody root systems of trees and shrubs, and the overall weight of the green roof system is greatly reduced as compared to an intensive green roof application with several feet of soil across the green roof. Working on a rooftop garden project? We can help! Call us 800-875-1392 or email sales@liveroof.com.